If you’re a fan of C.S. 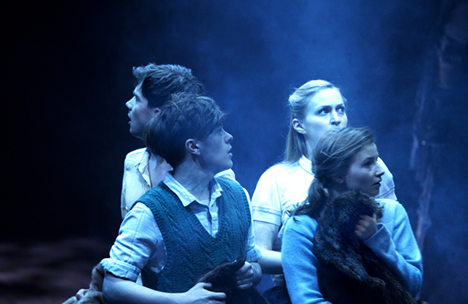 Lewis’ wonderfully evocative Narnia stories, you’re sure to love this production. However, even if you’ve never delved into Lewis’ snowy realms, you’re bound to love this show anyway! There was a happy buzz in the crowd approaching the temporary but impressive Threesixty Theatre tent in the lead up to this show. When I say ‘tent’ I’m speaking of the over-sized, round, pointed top kind used for outdoor festivals. As there are only thirteen round rows inside the cavernous but cheery theatre, it seemed as though we were all excitedly waiting together, in a one for all spirit. So when The Lion… began at last, a hush fell, not just because it had started, but because it was so instantly engaging. Siblings Lucy, Susan, Edmund and Peter, evacuees during WWII, arrive in the country, to take up residence with a kindly, wise professor who seemingly, only appears when the children are in need of advice. Otherwise, they play, and a game of Hide and Seek leads Lucy to climb inside of a large, wooden wardrobe. It is no ordinary wardrobe, as it transports her to an enchanted place – the Land of Narnia. How can I tell you what the storyline of this amazing show is really about? It seems to be about something different to nearly everyone you ask, so that would be difficult to pinpoint. However, for me and many, at its heart, it’s about childhood and the passage from it into adulthood that we all must face. From the moment the actors appear, we are riveted, ‘appear’ being the operative word, as through the course of the show, performers rise through mist aka snow and seemingly, step from dense darkness, materializing before us. Seeming as silhouettes, in a curling mist of train steam, announced by the sound of a retreating engine, Lucy (Rebecca Benson), Edmund (Jonny Weldon), Susan (Carly Bawden) and Peter (Philip Labey) arrive in the country, to make their way to the house that will be their home for the rest of the war. The youthful actors playing these vital roles imbue them with a feeling of the individual children’s trepidation, fears and inborn senses of adventure. Subsequently, we’re able to quickly spot the differences between them and, their personalities. 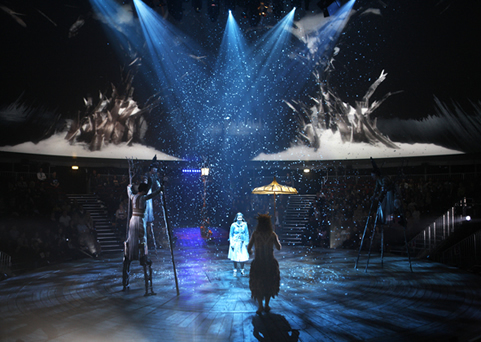 When wonder-struck Benson, as Lucy, is transported to Narnia, the wardrobe rises up around her, and with the help of projections on the 360 degree screens above the stage of the theatre, all around us, showing a rain of coats, enlarged wood texture, and the cold landscape of the snow-swept place she’s arriving in, we get a sense of being there ourselves! That feeling of ‘being there’ continues throughout the performance, adding considerably to its overall effectiveness. Sound and lighting are pivotal too, and this is such a large scale production that any idiosyncrasy or glitch in any area might seem magnified. Having said that, one of the most notable charms of this show is that despite the teams of people necessary to its successful staging, it retains a touching pared down feeling akin to the story itself, another reason those watching are able to feel so much a part of it. Lewis’ beloved tale unfolds before us, as it were. The stage in the round is a fine way of showing everyone watching the finer details especially when it slowly turns. Dense mist, also used very creatively, makes the onstage world white as winter. Projections on the 360 screen are well synched, with appropriate sound making the feeling of freezing and thawing almost palpable. Said projections, with animations directed by Chris Randall, are also, fascinating to look at in their own right. The incredibly tight orchestration of all of the elements of this show and the stunning results should assure it endless performances and, accolades. Smiles all around at the end of the performance we attended said more about the experience than any review or advert ever could. Faun aka Mr. Tumnas is also, sensitively played by Forbes Masson and his performance is something of a marvel as it gives us a subtle sense of an unwitting creature, struggling against its own survival of the fittest nature, a trait so called beasts share with humans of course, but here the difference is clear. But, I was enjoying the performances in this show so much that when my inner critic momentarily tutted during one of the show’s more child friendly moments, I inwardly urged it to kindly, buzz off! Such get out clauses applied when Brian Protheroe appeared as Father Christmas, Narnia being the land where it’s ‘always winter, but never Christmas,’ However, Protheroe was similarly winning as the wistful but wise Professor. Though, Olivier award winning actress Sally Dexter is the scene stealer of them all as the wicked White Witch, moving over tundras in a spectacularly regal manner in a sleigh, which circulated round the stage to ooohs and aaahs from children and adults alike. Dexter must have had great fun playing her role, as she’s so gleefully evil as the witch, that she’s a delight, though she must have been scary to small children, especially in scenes when she’s summoning bolts of striking, booming lightning! 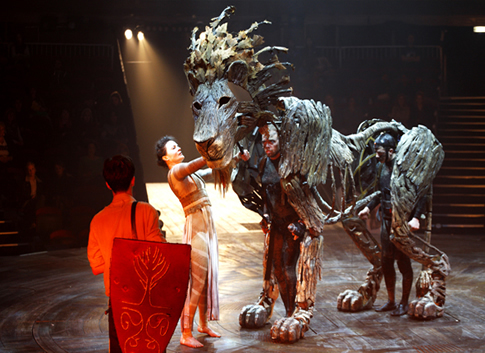 The only person who threatens to upstage even the White Witch is Aslan the lion, whose voice is supplied by noted actor, David Suchet, who though absent, seems very much there in spirit in his commanding but kindly role. Aslan is by far, the wisest character and those familiar with the story may feel a bit relieved when he appears, despite the trials he must pass through if the story’s to achieve its happy ending. Aslan the lion, an incredibly effective horse, similarly peopled by a couple of actors, and a few other surprises are enjoyably realized thanks to the hat-trick wizardry of Set, Costume AND Puppetry Designer, Tom Scutt, Max Humphries, who created them and Steve Tiplady who directed these clever, wondrous portions of the show. As if all of the aforementioned wasn’t enough, we have circus, in the form of aerial artistry, seemingly performed by angels, as well as some lofty trees and children. But this production’s symmetry is perhaps its greatest achievement along with conversely, its ability to keep its deceptively small framed, nonetheless, universally loved story earthed in magical mode. Occasionally over the years when watching productions, I’ve been at a loss for words, but in this case, I can’t recommend this very well crafted, staged and performed show enough. Its fantastic projections enable a sense of weather, time, battle, sorcery, etc. Though, despite all of its modern accoutrements, the essence of Lewis’ unique tale, influenced by his studies of myth, pagan folklore, Christianity and voracious reading couldn’t come across onstage without its directors, Rupert Goold and Michael Fentimen, the former of whom also adapted the story, though both, respectfully and, sensitively, allow its bittersweet subtleties to intermittently show through its’ more fantastical fairy-tale aspects. Bravo! Music drawing on a myriad of styles, from medieval through musical theatre is an added bonus in this production, with a couple of numbers especially aimed at children for good measure. An accordionist who is also a talented singer performs solo and in conjunction with two singer/clarinetists and a hand drummer – all of them, in character. There is also a smattering of dancing, limited more to those sections specifically geared towards young children, one of them with Father Christmas as its king-pin.